The Legacy West Urban Village in Plano is a busy place. More than 1,200 construction workers are rushing to finish the 38-acre mixed-use project that’s the centerpiece of the $3 billion Legacy West development. By late 2017, thousands of workers for Toyota, Liberty Mutual Insurance and JPMorgan Chase will be knocking at the door to eat in the urban village’s restaurants and shop. Eateries and retail in the more than $400 million Legacy West Urban Village will begin opening by late this year. By then, the first of more than 1,000 apartment residents will have moved in. About 85 percent of the shops and restaurants in the Legacy West Urban Village are already rented, said developer Fehmi Karahan. “We are going to deliver the first spaces to our tenants starting in July and August,” Karahan said. “They will then do their own work to finish out the interiors. Karahan said about 28 percent of the 335,000-square-foot shopping center will house restaurants. Mark Masinter, one of the founders of Open Realty Advisors, which is leasing the project, said retailer demand has exceeded his expectations. “I’d be lying to you if I said [I thought] we’d be at 85 percent leased at this point,” Masinter said. “It ultimately comes down to the location. “People really recognize this is becoming an important retail and restaurant hub and someplace they have to be,” he said. The 55,000-square-foot Legacy Hall food hall at the north end of the urban village is just starting construction and won’t be ready until the fall of 2017. The 300-room Renaissance Hotel will be open next spring. “We are a little bit ahead of schedule with the project,” Karahan said. 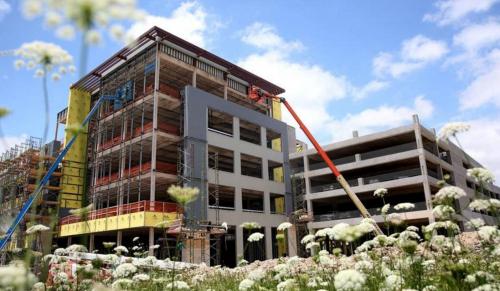 Toyota Connected — a new high-tech division of Toyota — and Fidelity Investments have rented space in the three levels of offices located above the Legacy West Urban Village storefronts. “We are talking to several more office tenants,” Karahan said. “The office component of the project is very important. Legacy West’s Urban Village includes more than 600 apartments in the first phase. Most of the rental units are on the upper floors of the shopping center along Communications Drive north of Legacy. Developer Robert Shaw — one of the original partners in the entire Legacy West project — said that the apartments start finishing in about 90 days. Shaw said his Columbus Realty Partners is already hearing from prospective renters. The cheapest apartments in the Legacy West Urban Village will start at around $1,000 a month — about a third less than the average unit in Dallas’ Uptown district. Shaw has had lots of experience with urban-style suburban apartment communities. He’s built high-density rental projects in Addison, downtown Plano and the Shops at Legacy in West Plano. His Columbus Realty — backed by Invesco Real Estate — has already purchased another development site just south of State Highway 121 for 400 more rental units. When construction started on the Legacy West Urban Village in February 2015, developers Karahan Cos., Columbus Realty and KDC thought the project would be a game changer for North Texas. “It’s everything I hoped for and more,” Karahan said. “This is going to be a place that for decades to come people will say ‘wow’.